What would you do if the school you train at either closed or moved out of the area? Would you continue to practice your art on your own? Without the guidance of an instructor, the social interaction of other students, or the obvious incentives of attending a public martial arts school, what would it take to motivate you to continue training? In his book, Living The Martial Way, Forrest Morgan writes, "...undergoing shugyo (austere training) alone, with no one else to motivate you... can temper your spirit like nothing else can. And there's no warrior ritual more traditional than solitary shugyo." Many of us unconciously appraise ourselves and our abilities based upon how others perceive us, including and especially authority figures, such as a teacher. Without a perspective that comes from without, we must rely on self-referral. This is a potent and meaningful way to live. Miyamoto Musashi had no master, and for the most part lived a solitary existence; he was a ronin. In the twilight of his life, Musashi retired to a cave to reflect upon his way -- his insights into the ultimate meaning of the martial arts. In the end, it was solitude that helped inspire Musashi to compose his legacy, The Book of Five Rings. Great entry! Self training is one of the hardest things out there but only then do all the revelations of true natures and reflections arise. I can definitely appreciate your point about self-training. It does take a lot of self-discipline and concentration. I know for myself, I could not self teach. A big part of why I go is for the socialization and interaction, even if it's a private lesson. I can say that even when I have the books in front of me, I either a) don't have the discipline to spend the time learning, or more often b)I read it, and end up doing it totally wrong anyway. There is a benefit from learning from others as well. While in time you can develop your own style, it helps to receive guidance from those who are more experienced to help you grow stronger. You had a entry recently of the benefits of a "master" and whether they were worthy of such a title. For me, whether it be a Master or anyone who happens to be ahead of me in the quest for their black belt, I benefit from learning from others, as I learn different ways to approach something than on my own, and see different perspectives that I would not necessarily gain if on my own. "What would you do if the school you train at either closed or moved out of the area?" Continue training. 3 times a week. I've found a style that suits me. An art I like. This is food for thought. I've never experienced that way of training. Except during the summer, at which point I continued training. Except that I was only re-doing acquired stuff. Learning nothing "new". If the school closed (which is subjet to happen, since Sensei has a precarous job) I'd train on my own and go to seminars to learn more. 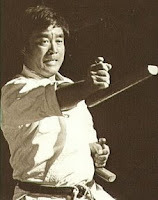 ocasionnaly going to distant Chito-Ryu clubs and relying on O'sensei's teachings. When you find "your" art or that it finds you, I think there's no other way. Miyamoto's book is great. Kind of puts all our Sensei - students system in another perspective. Martial arts alltogether in fact. In my opinion, the kind of person that can do what Master Miyamoto, or Sosai Oyama did by going into a solitary place, and training / developing on their own is quite unique, and unusual. I admire their strength, and commitment, but I know that for myself, I need to feel like I belong. I need a dojo with others within it to support, correct, and even annoy me. My instructors will often talk about people who will come to the dojo saying they're reading for their black belt, that they've "studied" online or through videos. They said it usually provides them with a good laugh. I think self-training is fine if you already have the discipline and foundation. If not, I don't think it can work. I've seen the ads for those videos. I'd be laughing too! Who comes up with this stuff? I would find another dojang that followed a similar philosophy as my current one. I train in solitude at least three times per week but it is mostly suplemental. I do practice what I consider essentials that I learned in Wing Chun (1st 3rd of the wooden dummy form) and boxing (bag work). However the rest revolves around taekwondo. I suspect that people like Miyamoto Musashi are rare indeed. Most of us mortals need a school, a teacher, and interaction with people of varying skill levels. Still solo training has a place in the mosaic. John, this is another thought inducing post, great food for thought. Anyway, as I said, great post! I find solitude rejuvenating. It gets easier to listen to our own inner truth once we cast off all the *opinions* of others. But it also takes a lot more discipline to work on whatever it is that is important to us, that's for sure. It wouldn't be a problem for me since I am the school owner LOL!! If I moved area I'd either see if there was an excellent school there already, a place where I could truly learn - or I would open my own place again. Where I live - there really isn't a school that provides the type of training and learning I would be interested in. That's why I run my own club and train at home. I enjoy solitude now and again, either for training, writing or just chilling out. Anyone with crazy kids under 5 years old will understand why. Extended, dedicated self-training changed my whole outlook on martial arts. I moved countries around four years ago and have been struggling to find a school ever since. I've been training on my own and I must say, it was so inspiring to read your post and the comments. I don't feel that it takes extraordinary discipline - I love my art so much that not doing it is simply not an option. I have learned a great deal about my forms through doing them on my own. And it's a big but - I don't feel I'm learning anything new. I'm not advanced enough to be able to develop forms and styles of my own, as the Masters may have. Also, I find that pushing myself as hard as I was pushed in class is very, very difficult. I have to admit to some lying on the floor and groaning, which would never have been allowed in class!! Also, I learned a lot from watching everyone around me in class. Sometimes a little competition is healthy, and I would push myself the harder for it. All in all, I think a mixture of both is good. And at the moment, I'm longing for classes again. I understand your dilemma. The classroom atmosphere provides a basis for comparison, as well as some camaraderie. Don't give up, though. When the time is right, you'll find the right school, or the right person to guide you. Thanks for dropping by, KFG. Thanks for the great words and the great blog. Will be dropping by regularly - it's a way to stay connected! Great blog! Ironically, self-study is easiest for me when my motivation is to come to class prepared. If there's no class to prepare for, would I continue to train on my own? Historically, no. But, as I'm getting older, the desire to retain what I've learned so that I can pass it on is becoming more of a motivation to do so. Good luck to KFG on your studies, and thank you John for the great site.